The first issue of Serenity: Leaves On The Wind is out today. This is the long awaited continuation of Serenity, which was itself the long awaited continuation of the Joss Whedon sci-fi western, Firefly. Firefly is that rare thing; a show whose central concept maps perfectly onto its fandom. The thematic topography of both is identical; scrappy underdogs, fighting back against the man and trying to keep going. It’s no accident that Firefly fans refer to themselves as Browncoats, echoing the name of the failed in-universe resistance. It’s a great show and a very good movie. 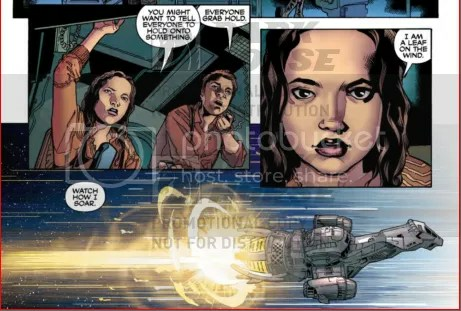 Serenity: Leaves On The Wind, isn’t the first Serenity comic but it is the first one to continue the story past the events of the movie. Zack Whedon, the writer, clearly relishes the opportunity to move the game pieces around and there’s a lot of really fun stuff in here. About half of it is fan service (Mal and Inara are together! We meet the leader of the Operatives! Sort of!) and half of it is surprisingly dark, starkly honest explorations of grief and why history is untidy. Seriously, anyone looking at the end of Serenity as a ‘blowing up the Death Star’ moment is going to be disappointed. Instead it’s the start of what seems to be a sustained period of political unrest and chaos, as the Alliance scrabble to obfuscate the events on Miranda and the New Resistance try and get their act together. Both of them, of course, are looking for Mal and his crew who, of course, have no intention of being found. As is always the case, they may not have a choice. That core idea; the underdog heroes with their backs against the wall and a broken bottle in their hands, is something Whedon clearly gets and tonally this is beat for beat what the show was. Georges Jeanty, fresh from extensive duties on the Buffy comics, does great work here too matching characters’ postures and mannerisms rather than their faces. The result is a book that’s never enslaved by likenesses but captures the essence of the characters and the show perfectly. It’s really smart work and meshes perfectly with Laura Martin’s colours, Karl Story’s inks and Mike Heisler’s lettering. Everything feels lived in and familiar, but the spacious panel layouts mean nothing every piece of information has room to breathe. It’s a clever use of space and art and the whole thing’s as impressive as anyone could have hoped it would be. So this may well be my occasional inability to get on board with a character everyone else likes but it does colour my perception of this scene. Also, bluntly, this moment is River, sitting in the seat of a man who gave his life for her, using his catchphrase. That feels almost cruel, especially after Wash’s ‘cameo’ earlier in the issue. Secondly, it’s an overt call back to both the movie and the title of the series that is, in turn, coupled to the ‘We ride!’ moment of emotional catharsis that closes the crew’s scenes this issue. That’s smart writing but it’s obvious where nothing else in this issue has been. It’s entirely possible it’s an air punch moment designed to be just that but if so, it feels overt and as a result, feels out of place. Thirdly, and this is almost certainly reaching too far, but River isn’t present when Wash dies. She has no direct way of knowing what he said so having her mirror his catchphrase and, looking at the issue again, his clothing at one point, feels very odd. This could easily be addressed by River’s abilities, someone telling her what happened or any one of a dozen other different scenarios but in isolation it feels like either a significant chord, or a misplayed one.